It was a busy week here on the farm with company and the big Thanksgiving feast. The weather has been pretty great, too – all sunshine and balmy temperatures. In November, this means more outdoor chores, such as, chopping firewood, cleaning gutters, etc. All of these activities mean that I only completed one painting this week. I call it Appletini since it features a big red apple in a martini glass with a silver shaker behind it. The reflections were what really attracted me. 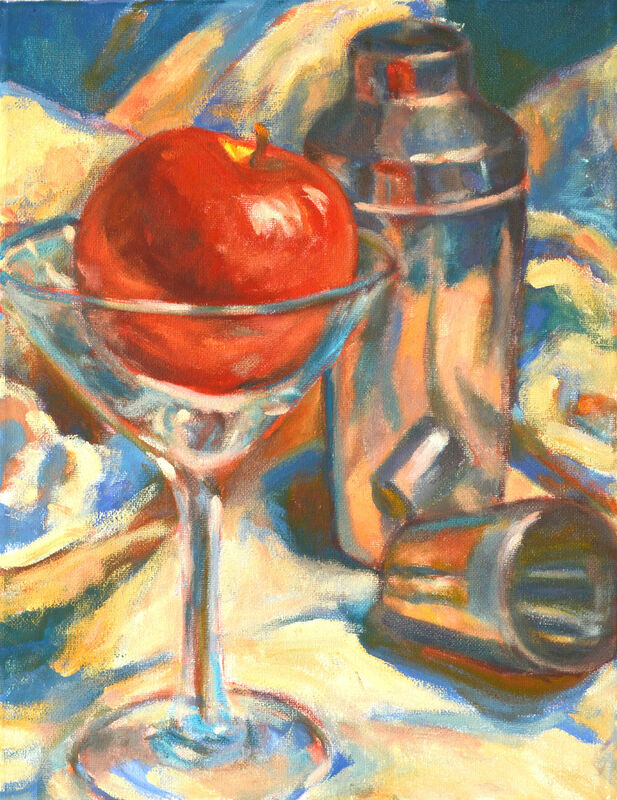 This is similar to previous paintings that I’ve posted on here, Apple Jack, and Two Lemons and a Martini Glass. I don’t know why but I like placing objects in unusual situations. Props courtesy of Goodwill thrift shop. I’m not quite sure if I’m finished with the painting but I probably am. What do you think? Of course, available on my Etsy shop and can be shipped in time for the holidays. This entry was posted in art, contemporary impressionism, still life, Uncategorized and tagged apples, art, contemporary impressionist, Etsy, impressionism, kit miracle, oil painting, still life. Bookmark the permalink.